Turkey and Japan are preparing to make a film project in commemoration of an Ottoman frigate which sank off an island around the Japanese town of Kushimoto in 1890, while returning from a goodwill voyage to Japan. The high-cost movie will be released worldwide in 2015, on the 125th anniversary of the accident and it is co-sponsored by the Turkish government, the Japanese Foreign Ministry and the Municipality of Kushimoto. 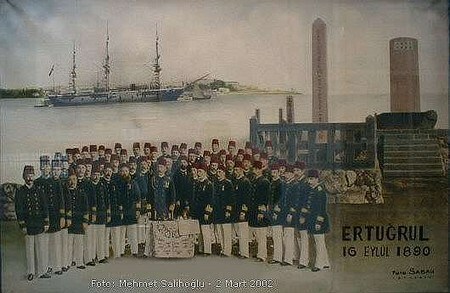 The Ertuğrul Frigate was sent by the Ottoman Sultan Abdulhamid II to give a gift to the Japanese Emperor. 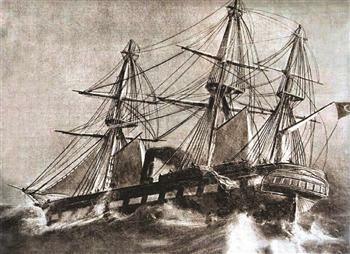 While returning from the voyage, the frigate encountered a typhoon off the coast of Wakayama Prefecture, subsequently drifted into a reef and sank on Sept. 16, 1890. The accident resulted in the loss of 533 sailors, including the admiral Osman Pasha. Only 69 sailors and officers survived and returned home later aboard two Japanese corvettes. The assistance of Kushimoto public for Turkish mariners, which is regarded as the milestone of Turkey-Japan’s friendly relationship, will be on screen on film, which will be directed by award-winning Japanese filmmaker Mitsutoshi Tanaka. Turkey’s Böcek Yapım will be in charge of the production. The Turkish Embassy in Tokyo will also hold an exhibition composed of wreckage parts and pieces from the museum on Kushimoto’s Oshima Island. The Ertugrul Exhibition’s inauguration will be launched at the embassy’s office on Oct. 29 and will last for three weeks. Another striking project for the Ertuğrul frigate will be completed by Turkish Ambassador to Tokyo Serdar Kılıç and Kushimoto Mayor Katsumasa Tashima. Kılıç and Tashima will dive into the wreckage of the Ottoman frigate in memory of the Turkish sailors who died in the accident. Tufan Turanlı, diving instructor and head of the Ertuğrul Project, who has brought thousands of frigate pieces to light, will accompany the ambassador and the mayor. Ambassador Kılıç said the scriptwriting of the film project will be finished soon. He said he had been putting great effort into the project since he took office and formed a committee to work with the issue. He said thanks to the committee, the scriptwriting was faster and effort to collect money for the budget was still continuing. “The friendship between Turkey and Japan is a unique one. The two countries are away from each other, but very close to each other. We are neighbors with our hearts. This is why I said ‘Let’s think big. Let’s make it a film to be screened on the world screen, not only in Turkey and Japan.’ The costs will be higher with this point of view because it is hard to shoot a film at sea, studios are needed. But anyway we will do it and reflect this epic of friendship,” he said. Kushimoto Mayor Tashima, speaking about the project, said that they had been talking with Turkish and Japanese officials for a long time for the film. He said the film would be directed by Japanese Mitsutoshi Tanaka, who won an award at this year’s Montreal International Film Festival and its script was written by leading Japanese script writer Komatsu Eriko and a Turkish scenario team. He said that Turkey and Japan each would give 300 million Japanese yen (6.1 million Turkish Liras) for the film’s budget and they were working to reach this figure. Tashima also added that they were waiting for the support of companies to support the project. The mayor said the Japanese tire company Sumitomo, which recently laid the foundation for a big factory in Turkey, decided to give financial support to the project. “When you have a big company sponsoring you, you draw the attention of other companies. We are expecting it, too. We wait for the support of Turkish companies,” he said. Tashima added that the schedule of the film was also determined. “’2015 will be the 125th anniversary of the Ertuğrul frigate accident. We plan to finish the film before this date. This is why shooting will begin soon. This film will be the best way to keep the unique story of the Ertuğrul alive for new generations. On the other hand, the generosity of the people of Kushimoto no more exists today. Our ancestors were more generous than we are. I hope the film will revive this generosity,” he said. Turkish ambassador Kılıç said they were planning to dive into the ocean where Ertuğrul submerged on Oct. 17 after a few days of training with Turanlı. He particularly noted the Japanese media was showing great interest in the diving. Mayor Tashima said the purpose of the dive was to commemorate those who lost their lives in the accident. “It is estimated there were 652 people in the frigate and 69 were rescued. More than 580 people died and 240 bodies were removed from the sea. This means that the rest are still lying in the depth of the ocean. We want to show our respect to these souls,” he added. He said he visited the Ertuğrul graves of the fallen soldiers on the 16th of every month to commemorate the victims and cleaned it. “It is a tradition in Japan to visit the graves of family members on the same day of every month. I try to keep this tradition for the Ertuğrul frigate victims, too,” he said. Önceki İçerikTolga Savacı – Küskün değilim; daha da hırslandım!